This page lists aggregated reviews of CMS Commander from different sources if available as well as user reviews by other WPscoop visitors. If you have experience with CMS Commander be sure to add your own review! Together with my in-depth feature and price comparisons these user reviews are meant to help people make the right decision for the best management plugin. Go here to find my main management plugin article and compare CMS Commander with several alternatives to find out which one is best for your requirements and budget. Currently there are 9 reviews of CMS Commander left by WPscoop users. If you have used this plugin be sure to add your own rating below! CMS Commander, for a small monthly fee, allows me to backup my websites, check their backlinks, create content, update all my websites at once, and the features together do what costs $60 a month by most other companies. This is a must have for business owners. The plugin has a big set of functionalities, is intuitive, is cheap, the support is wonderful. I have tested all Tools I found for this. If you handle with several WordPress-Sites, CMS Commander give you the best overview. With one List you see, where are Updates of WordPress, Themes, Plugin, New Comments, Offline-Problems, Number of Backlinks, PageSpeed, Visitors by Google Analytics and Security Information’s. You can quickly act from only one Dashboard to start Updates, Backups, moderate Comments, add new Pages, Plugins or Themes in all of your WordPress-Sites. That’s great. I love it. CMS Commander, makes your life easy by letting you manage, clone, duplicate, backup sites to your favorite cloud storage or local storage, save sites as template to use them again and again and much more. Very handy for bulk management of WordPress websites, eg. plugin & theme updates & installs, affiliate content search & adding as posts across a number of sites, etc. Excellent software/service. CMS Commander is constantly being upgraded and new features are being added as well. We love it!! Simple and easy to use and the tech support is great. I’m a marketing consultant and work with several clients at a time. CMSCommander allows me to keep all my client’s sites updated and easily install plugins, duplicate site templates (saving me tons of time and my clients money) among other things. I could not provide the same level of service at a reasonable rate without it. CMS Commander has helped me manage all my blogs for years and saved lots of time in the process. It is reliable, easy to use and offers lots of features for a fair price. If you have experience with CMS Commander yourself please leave your own review in order to help others choose the best management plugin for their needs. It will only take a minute! CMS Commander is a hosted service to manage multiple WordPress sites. It allows you to add any number of websites to manage them from a single dashboard. That will save you a lot of time you would spend on your day to day WP management tasks by automating them or processing them in bulk. The service was launched in 2012 after a long beta phase. It is currently used by its members to manage over 20,000 WordPress weblogs according to its developers. 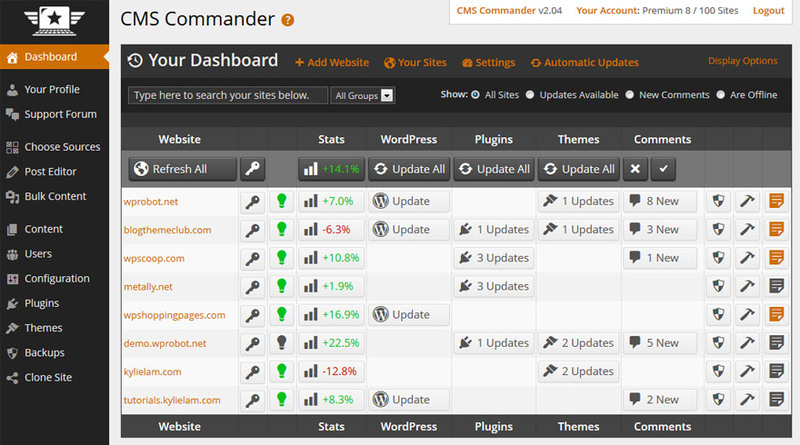 A look at the CMS Commander dashboard from where you can manage all your WordPress blogs together. There is a core set of features that is part of all WP management services compared here: They all let you add all your website to a single account, update plugins and themes easily, quickly login to your sites and create backups. What is different is how they implement those basic features in their interface and how easy to use their management dashboard (pictured above for CMS Commander) is. Besides the basics mentioned above CMS Commander does focus on providing bulk actions that allow users to perform tasks on any number of websites simultaneously to save time. CMS Commander for example includes the feature to bulk create any number of new WordPress user accounts on multiple weblogs and to edit or copy WordPress settings to a whole network of blogs. CMS Commander is also the only management service to integrate with 20+ third party API services. Those can be used to generate automatic content as well as for article spinning from inside the CMS Commander dashboard. The integrated partners include Amazon, Youtube, Google and many other big internet companies. Members can use the content returned by these partners to enhance their posts with related images, videos, affiliate ads or other content completely free and legal. CMS Commander is a very solid service for managing multiple WordPress blogs that is competetively priced: While offering a large amount of features, including several unique ones like automatic content and rewriting integration, it costs less than most of the alternatives. CMS Commander offers a free account with limited features that includes a 30 day trial to all premium features. The price of a subscription to all premium features is based on the number of websites you want to manage remotely, starting at $8 for 5 websites. You can pay monthly or yearly at a discount and many different payment options are accepted, including Paypal and all major credit cards. Follow this link to compare the price of all reviewed WordPress managers and find the most affordable one for the amount of blogs you want to manage and the features you need. CMS Commander has a rating of 96% (out of 100) in the official WordPress plugin directory. In total there are 23 reviews for CMS Commander. Go to WordPress.org to browse all the reviews. Please note that the reviews in the plugin directory are only for the free version of CMS Commander and not for the pro version or any commercial addons. The free version has been downloaded 90539 times. With CMS Commander you can use 32 out of 35 features that I track for WordPress management plugins in my comparison. Click the link to see a list of all available features. Please note that I only track features as reported by the developers in this review and comparison. I can make no judgement over how well the features listed below will work for you. I recommend you test CMS Commander and some of its competitors yourself before deciding. See the table below for a quick overview of CMS Commander prices as well as a comparison with average prices of management plugins. Please go to the main article to compare the price of CMS Commander with other management plugins. I have also reviewed many competing products that allow you to manage multiple WP blogs. There are several worthy CMS Commander alternatives you should consider before making your decision on which WP manager to use. Follow the links below to see my reviews of all alternatives to CMS Commander. Follow the links below to compare the features of CMS Commander to any of its competitors. Each of the WPscoop comparison articles takes a look at two popular solutions to bulk manage WordPress. Here is a small collection of reviews of CMS Commander done by other websites that are worthwhile to read. If you have written a CMS Commander review you would like to see featured here simply contact me and I will consider including it. What is your own experience with this plugin? Please share your opinion by posting a review of CMS Commander with the form above!